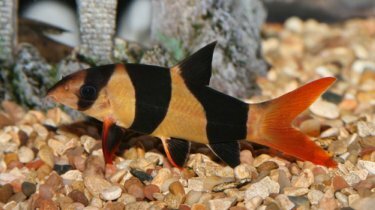 The Clown Loach is perhaps the most popular loach available to fish keepers. A lot of their popularity is down to their snail eating ability. They are also brightly coloured, make them an attractive addition to the aquarium. In the wild they can be found in South East Asia. They fish are very hard to breed, so they currently imported from the wild. These are very social fish and like to be kept in groups. 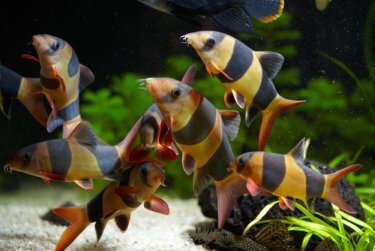 Like many loaches they are livery and playful. They should be kept in groups of a minimum of four. When kept alone they become depressed and are more susceptible to illnesses and infections. They are peaceful and non aggressive. Clown Loaches have a bifurcated subocular spine, which is moveable and located under the eyes. It is used mainly as a defence mechanism, but when used it can give fish keepers a painful wound. So care should be taken when trying to move these fish. They have the ability to put holes in plastic bags. They have a odd habit of playing dead and acting ill, such as lying very still on their sides. They also make clicking sound when they are happy or upset. The first time I heard mine making a clicking sound I was very confused and could not work out what it was. Although often sold when small and young they can grow up to 12 inches in length. Therefore you will need to be prepared for their future growth when deciding on a suitable tank. If you are thinking of buying these for a community tank which is already set up, you need to consider an alternative fish if your aquarium is less than 200 litres . 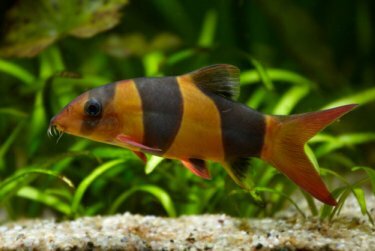 If you are buying these loaches for their snail eating ability, there are alternative snail eaters available. Many cichlids also enjoy eating snails. I remember my Angelfish picking snails off the aquarium glass. You can also now get a snail eating snail, which is called the Assassin Snail. They can be shy sometimes so you should include hiding places for them. They also apieciate some live plants. In the wild they live in fast moving waters and to make them happy in the aquarium you should try to recreate this as much as possible. This can be done with air stones or power heads. You should aim to feed them a varied diet including flake food, sinking pellets and live food. They will also help themselves to any snails which are in the tank. They have so far been no confirmed cases of these fish breeding in the aquarium. Although with improvement in aquarium technology and fish keepers knowledge of fish breed it is possible they will be breed in the aquarium at some point in the future. These fish are very prone to White Spot Disease (inchthyophthirius). As with all aquarium diseases prevention is always better than a cure. Fish are more prone to disease and inflection when they are stressed . Stress cause their immune system to suffer. So to prevent an outbreak of White Spot you need to do everything possible to stop your fish from getting stressed. Copyright © 2011 to 2015 amysguidetoaquariumfish.com All Rights Reserved.